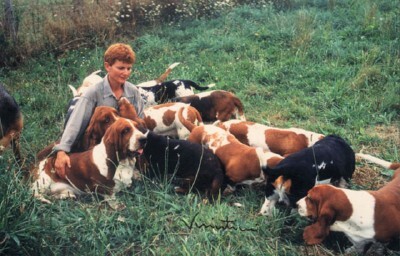 Since 1986 I've been breeding as a professional this wonderful breed which seduced me by its beauty and personality. The kennel's excellence in selecting breeds and its great results in championships and showcases made for a great reputation, I strive to maintain this level of excellence and always do better. Being a breeder isn't an easy task, but what a dream to live in the countryside surrounded by animals, being rewarded by champion titles and customers' phone calls telling us how happy they are with their companion. 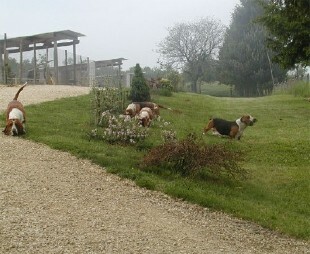 The kennel is located on a 35-hectares green and hilly domain. The domain being entirely fenced I can enjoy a long daily walk with all the dogs!! 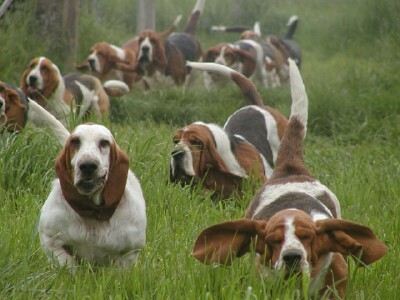 What is more beautiful then a bunch of Basset Hounds! I am dedicated to having the cleanest kennel, knowing how important it is for my puppies' survival and the adult dogs' well-being. To assist me I have several employees and we are always at least 4 people working on a daily basis. This way nothing is neglected. The adults are in small groups according to their age and personality. They are free to walk around in the park or stay in their building, they are never locked up. The nursery is in the house. It is an essential part of the kennel, I wanted the nursery to bring the maximum comfort and security to mums and babies. The nursery stalls are all equipped with video surveillance, floor heating and Air conditioning. The room has an incubator, oxygen extractor, ultrasound machine, etc. 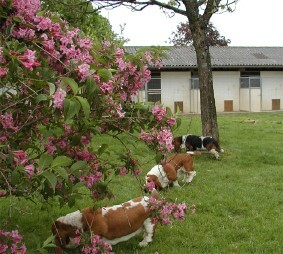 In order to give our puppies the best possible care. Maternities welcome mums and babies after leaving the nursery, the have spacious, heated space and babies have a little fenced yard to explore the outside world. For grooming our dogs we have a special air conditioned grooming room for the well being of our dogs (and ours). I hope that these few pictures will incite you to visit us, and show you how much we respect and love our dogs and how much energy we put into our work at the Haras de la Vergne .